Barracuda Backup is a complete cloud-integrated solution for protecting physical and virtual environments that includes software, appliance, and offsite replication. Barracuda Backup is simple to deploy, easy to manage, and offers unlimited cloud storage. With an extensive range of supported environments and integration with Copy file sync and share services, organizations can replace multi-vendor piecemeal backup solutions with an all-in-one Barracuda Backup appliance. Barracuda Backup supports replication to another Barracuda appliance for private-cloud data protection or secure transfer to the Barracuda Cloud. Barracuda Backup is a complete cloud-integrated solution for protecting physical and virtual environments that includes software, appliance, and offsite replication. No integration of, or debug struggles with, multiple vendor backup technologies. Dispersed organizations get the benefit of managing their entire network of Barracuda Backup appliances, regardless of location, via a single cloud-based management console, simplifying global data protection. 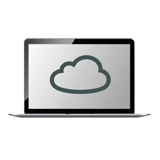 Barracuda evolved the Cloud beyond a compelling metered backup storage medium with unlimited cloud storage plans, Cloud LiveBoot of virtual machines, and on-demand user access to files via Copy (www.copy.com) file sync and share. The Barracuda Cloud provides benefits beyond traditional cloud offerings. Initial deployment of a backup appliance can take as little as 15 minutes. Barracuda’s simple yet powerful web interface enables quick set up and provides a complete view of all machines in the global network. Intuitive GUIs with multiple levels enable detailed control and analysis of performance without complexity. The Barracuda Backup appliance’s local cache scales from 500 GB to more than 100 TB. Offsite vaulting allows longer-term backups to be stored only in the cloud, freeing cache space for more daily and weekly backups and extending appliance life. A maintained Instant Replacement subscription lets organizations replace their appliances every four years with a new Barracuda appliance.